For three years in a row, guests at the New York based Hebron Fund's Annual Dinner, which raises money for the Jewish settlement in Hebron, have had to walk by protesters led by Adalah-NYC. That protest was endorsed this year by: The New York Campaign for the Boycott of Israel, Al-Awda NY, American Jews for a Just Peace, Brooklyn For Peace, Code Pink, Columbia University Students for Justice in Palestine, Delaware Valley Veterans for Peace, Israeli Committee Against House Demolitions-USA, Jewish Voice for Peace, Jews Say No!, Middle East Crisis Response, Siege Busters working group, War Resisters League, WESPAC, Women in Black – Union Square, Women of a Certain Age, Woodstock Veterans for Peace. In other words, the usual suspects, God bless them. 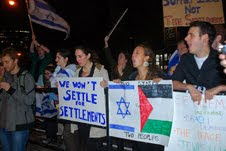 But this year a separate protest was organized by J-Street U, the student wing of the progressive Zionist organization. They came with Israeli flags and sang Hatikvah. As far as I know, this is one of the first times that J Street U has demonstrated alongside – yet retaining its separate identity and message – a protest organized by the Palestinian groups and leftwing Jewish and Christian groups. This, dear readers, is something new in the US and shows the impact of Israeli activism on progressive Zionist young men and women. American Jews go to Israel and see the joint struggle against the Occupation. They hear the young Israelis of the New Israeli Left chanters slogans like "From Bilin to Sheikh Jarrah, Palestine will be Liberated". They witness the obscenity of the Separation Fence, the destruction of Hebron's main commercial district for the sake of gun-toting Ku Klux Klanners wearing yarmulkes and tikhels instead of white sheets. They go to Sheikh Jarrah – I have seen them there – and then they return to campuses. Pro-Peace, Pro-Justice, Pro-Israel. I don't know what the Adalah-NYC or the Hebron Fund crowds made of the New Kids on the Block. But this won't be the last time, I hope, that they join the protest against the bad guys. The understanding was that it was going to be what I considered to be an honest and open conversation with a liberal Jewish organization, but I clearly did not understand how deep the antipathy is among a group within the Jewish community toward J Street and toward Jeremy Ben-Ami,' he said. Translated into terms that an historian can understand – Israel is beginning to tear apart the American Jewish Community, and it will happen shul by (non-orthodox) shul. If you marginalize J Street – liberal Zionists, ribono shel ha-olam – you are going to marginalize the even more progressive Zionists of the next generation. And as the Occupation drags on, more young Jews will see J Street U (and to its left) the proper place for them. The AIPAC crowd doesn't get this. They see a future in which Jews who care about Judaism will be overwhelmingly pro-Israel – and the others who don't will just melt away in the American pot. They may lament the statistics, but secretly they have to be happy about the prospects of liberal Jews not caring about Israel's misdeeds. But here they are mistaken. The first rumbles of the earthquake are already out there. I suggest that the Federations, hurting from shrinking donations, should adopt the slogan, "We Aren't One Anymore"
As for J Street – they have had a consistent message from Day One. It so happens that I don't agree with much of that message, and they don't agree with mine. That's fine. But they have established their presence and their credentials, and they certainly should have a place at the pro-Israel table. I actually think, in this case, it's all about the community's question, which is totally legitimate from my perspective as an observer, of 'What is J Street?' Is it simply a progressive organization that supports a different policy for the state of Israel, or is it a Trojan horse for anti-Israel activists? That question is legitimate only if there is evidence that J Street harbors anti-Israel activists. If protesting racists and bigots supported by the Hebron Fund is considered "anti-Israel" then J Street U is guilty as charged. But if you can't find within the leadership of J Street "anti-Israel activists" – people who are trying to destroy the Jewish state – then the "legitimate question" seems more like an McCarthyesque insinuation. Or should I have said "Glenn Beckesque"
The majorty non-orthodox religion of the Jewish people in the diaspora is not "Judaism" it is "Pro-Israelism". Pro-Israelism does not have the power, tradition, or depth to keep young (or even older) Jews in this new faith. And if that continues it will be a major tragedy. Great post! This is exactly what American Jews, and Israel, need. I can't wait for the day that there is a Palestinian state living alongside Israel. It is in the best interest for us Jews to keep Israel a Jewish state, not occupying millions of people who have no interest in being a part of it. The old-timers who believe that non-Zionist Jews will fade away may be partly right (for many people in America are apathetic about all kinds of moral issues). However, they are also partly wrong. Many Jews (including secular ones such as myself, born to secular Jews in 1938), are nevertheless deeply seized with moral issues -- and believe our anti-Zionism (or our anti-current-Israeli-crimes-and fascism-ism) to be moral issues of particular importance to us because we see ourselves as Jews. Because and not in spite of. MY REPLY: As our grandmothers used to say, "Six of one, a half dozen of the other." Young Jew, With Whom Do You Stand?